I’m off to Fish Creek for a couple of days with some of my postgrad colleagues for a writing retreat. The Gods are smiling on us by sending lots of rain our way, hopefully enforcing an inside long-weekend. Several of us attended a retreat conducted by Ron Adams from La Trobe last year, and we decided we’d like to do it again. As one of the activities we’ve planned, we were asked to bring a couple of pages from a historian whose writing we admired. So who to choose? There is of course my beloved Richard Holmes, but then I realized that even though I gobbled up his Footsteps and Sidetracks, I haven’t actually read any of the biographies that he used as the basis for his meditations on biography and history. What about Inga Clendinnen then? Certainly right up there in my constellation of historian stars, but Ron’s workshop made much of the Clendinnen-Isaacs-Dening triumvirate, and I’d like to choose someone different. Tom Griffiths I considered, and Lisa Ford too. But in the end, I went for Kirsten McKenzie. I haven’t reviewed her work in this blog because I read it before I started writing here. Her book ‘Scandal in the Colonies’ was the book that made me start thinking about how I could deal with Judge Willis. She combines incisive observations about colonial life, status and behaviour with real-life, sympathetically drawn examples. The book is replete with beautifully crafted, pithy sentences, but the overall effect is light and readable. You feel as if you’d like to meet the author, that there’s a sense of humour there. She deals, as I want to do, with the nuances of behaviour as perceived by others at the time, that rumble underneath the official correspondence and are magnified and parodied through the rumour mills and the hysteria of the press. So, off to Fish Creek I go- laptop in hand, no internet access (I hope) and Kirsten McKenzie tucked under my arm. Judges’ wives don’t tend to get much of a look-in in the judicial biographies written about their husbands. As you might expect, in such books the emphasis is on the judge and his interactions on the bench and amongst his judicial peers and government officials. The wife and children- if they are acknowledged at all- tend to cluster off-stage in the folds of the curtains. Not so in this book, which consciously focuses on Anna Murray Powell, the wife of Chief Justice William Dummer Powell, of the Kings Bench Upper Canada. It was her husband’s position that gave Anna Powell her own prominence within York (Toronto) society, but I suspect that she would have been the subject of biography in any event. The Powell family were prolific letter-writers, and more importantly, the letters were saved and now are scattered between archives in Ottawa, Toronto, Boston, New York and Washington. Anne herself generated about 2,500 pages of letters alone, written over a span of 50 years, most particularly to her brother George Murray in New York. These are rich letters for the social historian- full of family news and waspish commentary about York society- and they provide a solid basis for a study of Anna Powell and her family in her own right, not just as the wife of the Chief Justice. 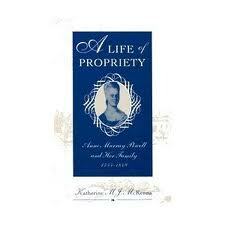 Anna Murray Powell was born in Wells, England in 1755 to parents of a middle class background. She emigrated at the age of 16 with her Aunt Elizabeth, who had herself emigrated to the New World at the age of thirteen and established a thriving millinery business in Boston. On a trip back ‘home’, Aunt Elizabeth was horrified by the new ideals of middle-class female domesticity becoming popular in England, which did not sit well with her own ideas about female independence and business activity. She did not have children of her own, and as seemed to be common at the time, ‘adopted’ her nieces and brought them back to Boston to manage her business. What might have been a good solid business experience for a young man was greeted by Anne and her sister with reluctance and resentment. She was mortified by working in ‘trade’ and she carried this sensitivity about her pre-marriage working life throughout her life, and indeed it may have contributed directly to the stiff-necked and inflexible ‘propriety’ that she demanded of her family, and all other York inhabitants in her social circle. The book is divided into four parts. Part I ‘Learning and Living the Lessons of Propriety’ is largely biographical, tracing Anne’s childhood and adolescence, prolific childbearing years (nine births) and her establishment of her status within York society. The narrative then bifurcates into a gender-based analysis of her family relations. Part II ‘The Intersections of Male and Female Gender Roles’ examines Anne’s relationship with the men in the family: husband, brothers and sons. Part III ‘The Transmission of Female Gender Roles’ examines education, marriage and childbirth within women’s lives in Upper Canada, and closes with a fascinating analysis of the lives of her three daughters. Part IV ‘Conclusion’ deals with her life as widow and elderly matriarch- an aspect of women’s lives that is often dismissed in a few sentences- a life-stage which, as we (I) embark on an increasingly-lengthened old age will probably attract more historical scrutiny than it may have received in the past. The book draws heavily on Barbara Welter’s 1966 article ‘The Cult of True Womanhood’ (American Quarterly, 18, 1966 p.151-74), a fairly dated article for such a recent book, and a choice that was questioned by several of the reviewers I have read. McKenna cites Davidoff and Hall’s Family Fortunes, but it is the True Womanhood trope that she returns to most often. Despite Anne’s strict insistence on ‘propriety’ and her incorporation of it into her own identity, you have to admit that her children were a bit of a disappointment. The ‘good’ sons tended to die tragically, leaving the family with the duds. Among her daughters, there was one ‘good’ daughter who trumped her mother in the fertility stakes, popping out ten children in an alarming succession. Another daughter remained the unmarried maiden aunt, a companion to her mother and built-in helpmate to her spawning sister. The most fascinating chapter was that concerning the ‘unnatural’ daughter, Anne Murray Powell Junior. It is a very nineteenth-century take on the difficulties with parenting a wilful and troubled adolescent daughter. The story of Anne Jnr.’s infatuation with John Beverley Robinson, the future attorney-general, has been told by other historians, but I suspect not with the sensitivity that McKenna brings to the situation. It all ends tragically, and although the expectations and language of these unyielding 19th ‘pillars of society’ in their treatment of their daughter might not sit well with us today, the experience of parenting, loving, and losing transcends these differences. Anne Murray Powell’s voice through her letters to her family is strong, censorious and inflexible. Her letters are laced with a religious sentimentality which does not quite cover the snippiness, complaint and smugness that she expresses in almost the same breath. Through the richness of the family archive, and through McKenna’s own insightful treatment, you feel as if you have been in the presence of a formidable woman. I think I prefer her at a distance. Read because: it’s set in York at a time very close to my own research interest. Many of us will have heard or read that Di Gribble, of the now-defunct McPhee-Gribble publishing house died several weeks ago. I read and reviewed Hilary McPhee’s book Other People’s Words a few months back here and when I heard the news, I wondered what had happened after McPhee’s book had been published. How did Di Gribble react? I wondered. How did they feel about each other’s career in the wake of McPhee-Gribble’s demise? Hilary McPhee answered many of my questions in a tribute that she wrote for The Drum recently. I urge you to read it here. 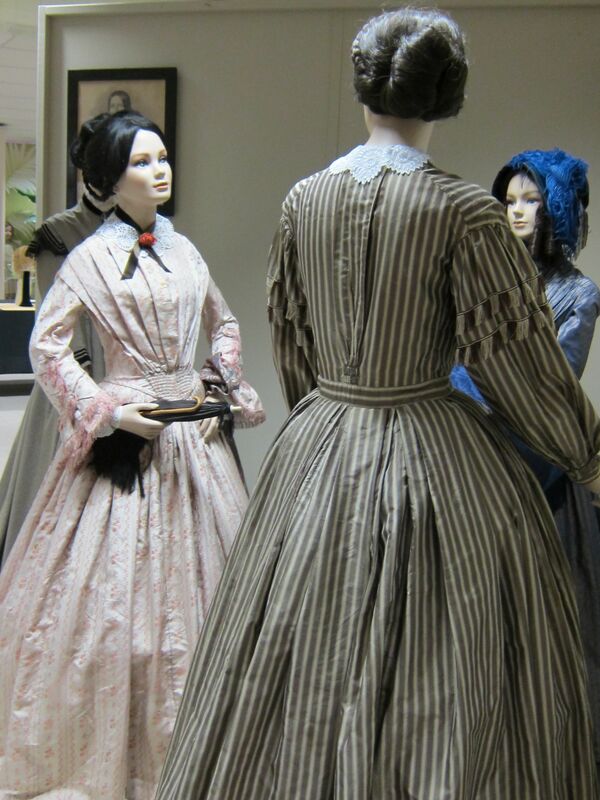 Should someone suggest to you a visit to a private costume museum out at Bulleen, then just say yes. 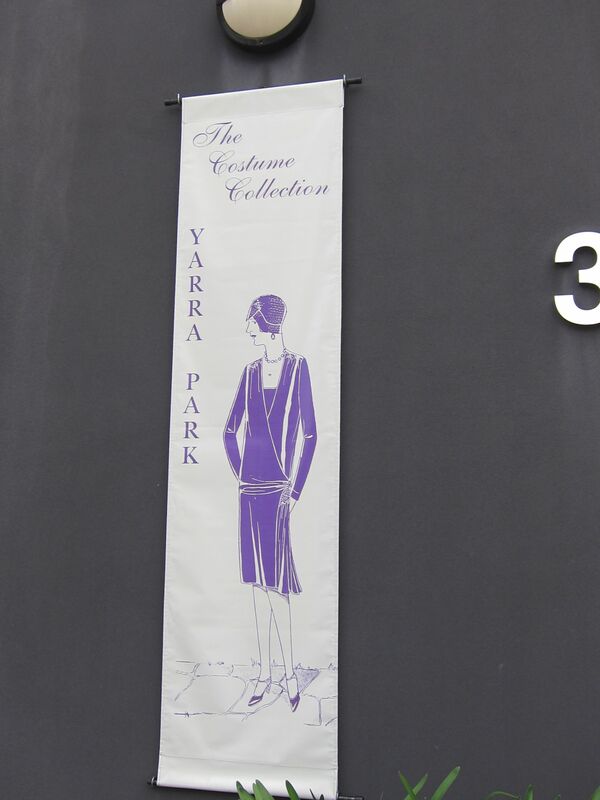 They’ll mean The Costume Collection, Yarra Park in Greenaway Street Bulleen. You’ll drive down Greenaway Street (named for an early farmer in the district), past the factories and chain wire fences and you’ll think “This couldn’t possibly be right”. But it is. The owner and curator, Loel Thomson, describes her museum as “a hobby that grew”- hence the rather unconventional setting in a factory in a small industrial pocket beside the Yarra River. The factory, however, provided many of the things her costume museum needed- space, few windows and an airconditioned and filtered atmosphere. She has more than 10,000 items in her collection, though only a fraction of them are on display at any one time, and the display changes regularly. 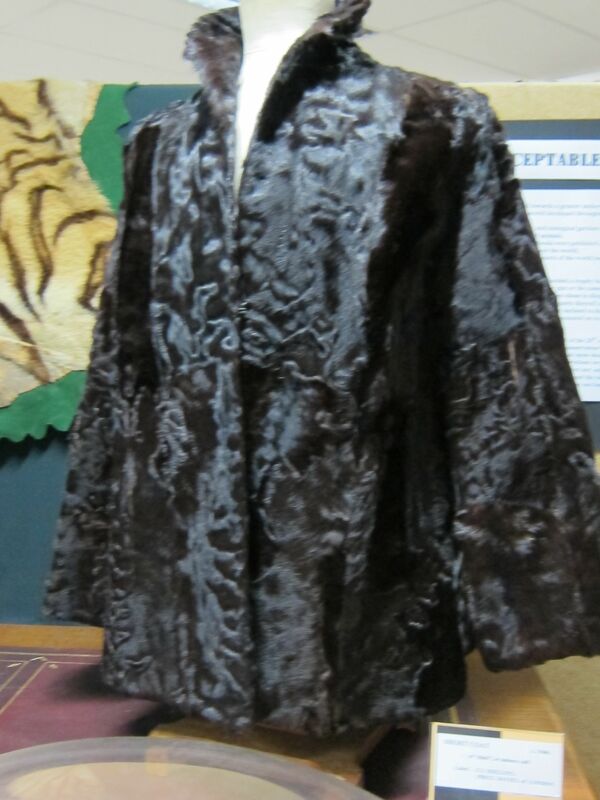 that looked like fur jackets that I remember women wearing. It’s only when you read the sign that you realize that ‘slink’ means ‘unborn calf’. What travesties euphemisms cover! 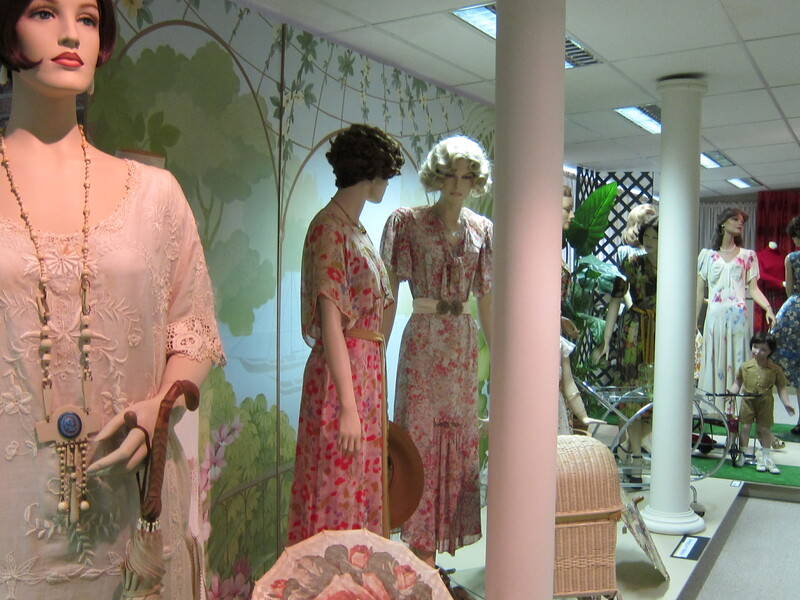 Her aim in creating the museum is to collect everyday clothes that people wore. Obviously the clothes were treasured enough for them to be preserved by family, or put away ‘for good’. Many of them are purchased, commercially-produced items (she shows the labels) and although there are some formal wear costumes, most of them are day clothes. She has a large library of magazines, pictures and books in order to research her displays, and in many cases she has been able to match private photographs of people wearing similar clothes, or magazine advertisements, to the costumes on show. The museum is open only by appointment, so you’ll need to ring Loel Thomson herself on 9852 1794 and if there’s only a few of you she may be able to join you up with a larger group. There’s a small entry charge by donation, which goes to charity. It’s worth every cent and more. There’s more photos from her collection here in a blog from February 2010- they are all beautiful too, and most of them were new to me so the display obviously changes quite substantially from time to time. So- if you’re offered an opportunity to see it, or if you’d like to organize a trip for a group yourself- do! An article in the Age on Saturday 8th and my response to it. You’ll need to scroll down a bit- obviously it wasn’t headline material! I don’t always read the epigraphs that grace the front pages of a book. To be honest, I’m not really sure what purpose they serve- are they an encapsulation of the book in someone else’s words? are they a nod to writers who have come before? or are they a window into the texts that served as inspiration for the writer? Probably all of the above, and I suspect that in this case, the latter is close to the mark. and Memory, the flood that does not flow. ‘Five Bells’ is a nautical term that measures the elapse of a four-hour watch on board ship, and the focus of time elapsing is pertinent here because we are very aware of it in the structure of this book. 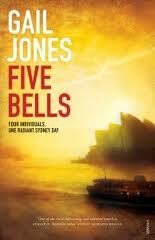 The book is set on one summer Saturday, around Circular Quay (there’s that water theme again- and it emerges again throughout the book) as four people converge there from somewhere else, and the narrative swings from one character to another, in a sequence, not unlike the chiming of bells. Round and round it goes, from Ellie to James to Catherine to Pei Xing then back to Ellie again as the day breaks clear and blue and creeps on to one of those night-time storms that Sydney summers are noted for. In this regard, it reminded me very much of Virginia Woolf’s The Waves, which took six friends, each writing from their own stream of consciousness. However, here the characters in this book are observed minutely, yet from a distance, rather than speaking in their own voices. Nonetheless, it is very much an interior description, ranging over their memories, fears and disappointments across decades and continents. In another nod to Woolf, there are echoes too of Mrs Dalloway in its single-day focus. Her characters are each suffering loss of differing degrees: loss of relationships, loss of brother, loss of freedom, and exposure to tragedy. Their stories are revealed gradually, as the spotlight of the narrative swings onto them before moving on to the next character. There are resonances between the stories with multiple allusions Pasternak’s Doctor Zhivago, eight year old girls etc. which at times felt a little forced, but I suppose evokes the same sense of connectedness and chance that we feel with the concept of ‘six degrees of separation’ and other such life coincidences. Despite the rhythm and symmetry of the structure, the characters are not equally well-developed. Catherine, the Irish tourist, never really became real to me, and although Pei Xing’s story was touching, I found it difficult to actually understand and thus accept her motivation for acting the way she did. I think that Ellie and James, meeting again after twenty years, were the most clearly defined characters. I must admit that I only made the connection with the maritime use of five bells when I googled it for this posting. While I was reading it, I assumed that it referred to the characters and the circular way of telling their stories, like the rounds of a church bell. There are four of them- who was the fifth? For much of the book I wondered if it was Sydney itself, which with its harbour, the ferries,the Opera House, Luna Park and Circular Quay is almost a character in its own right. But then, in a marked change of pace near the end of the book, two other manifestations of what could be fifth character come into view. This comes as rather a jolt. I had been lulled into the almost soporific rhythm of the narrative and all of a sudden it changed direction. I’m not really sure, though whether this sudden plot development was wise, or necessary to the book. It changed the trajectory of the book and made some plot scenarios possible, but I think weakened the overall effect. It is only a short book at 216 pages, and that is probably exactly the right length. It is very carefully written with almost every phrase and image carefully burnished. Perhaps a little too polished for my liking- I found myself almost smothered by such intense, artistic writing- and so, while unsure about the necessity of the change of pace near the end, I greeted it as an escape into open air from a rather oppressive, perfumed interior. I have set this post aside for a couple of days, unsure of how to sum up my response to the book. Ambivalent, I’d have to say. I admire the cleverness of the endeavour and the complexity of her allusions to other works of literature and acknowledge that there are some beautiful images and phrases. But I need to balance that with my misgivings about the plot development at the end of the book, and my feeling of overload from a surfeit of fine writing. Not sure. Copy sourced from: Yarra Plenty Regional Library and then, when I was unable to renew because it had a hold placed on it, La Trobe University Library. Thank you Red Symons- you’ve verified something for me. Whenever I listened to the Geelong Football Club song (and we’ve heard it once or twice over the last 48 hours), I found myself puzzled by the first couple of lines. Was it being sung in unison? Why did it sound a bit “off”- as if it was supposed to have two parts, but only one was being sung? I kept trying to sing a different melody in my head over the top. But in Red’s program this morning (heard rather fuzzily in my daylight-savings time dislocation where 7.30 a.m. was really only 6.30 a.m.) he mentioned that the Geelong song was inexplicably recorded – I can’t remember the correct musical expression- down a third (is that how you say it??) for the first lines. Here’s the Geelong song and here’s the way it is in Carmen. I’m pleased to hear that it IS different- it’s not my imagination: just my paucity of musical theory and terminology to explain what I’m hearing. I don’t need theory or terminology to hear that something is very, very wrong with Meatloaf (or Mr. Loaf as an article in The Age designated him last week). Anyway, good on you Geelong. Anything, anything to stop that triumphalist “Coll-ing-wood” chant. It still turns my stomach after St Kilda’s grand final loss last year.